The Chinese viewpoint of a balanced diet is tailored to individual needs. 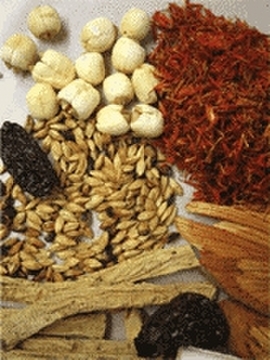 Generally it is recommended to eating Yin foods during the winter and Yang foods during the summer. A balanced diet is one which includes all 5 tastes – spicy, sour, bitter, sweet, and salty. Foods and herbs which have a particular taste tend to have particular properties. For example, bitter herbs and foods tend to be drying and Cold. This tends to make them good for treating Damp Heat conditions, but contraindicated for people who are too Cold and/or too Dry. Many of them have antibiotic-like properties. On the other hand, the herbs and foods with a salty taste tend to be warming and moistening. This tends to make them great for treating people who suffer from Cold and Dryness, but they should be used cautiously in people who are Hot and Damp. In general, meats tend to be Yang and veggies tend to be Yin. But the way food is prepared also affects the amount of Yang or Yin energy it has. Frying tends to increase Yang, and steaming tends to increase Yin. Thus, stir-fried veggies are more Yang than steamed veggies. A person who is Yang Deficient would tend to stir-fry the vegetables s/he eats whereas a person who is Yin Deficient would tend to benefit from eating more steamed veggies than stir-fried ones. Food which is served cooked and warm are more warming than foods which are raw and cold. For example, celery which is cooked in a stir-fried dish which is served warm is going to be more warming and more Yang than celery served raw in a cold salad. There aren’t any “one size fits all” diets.